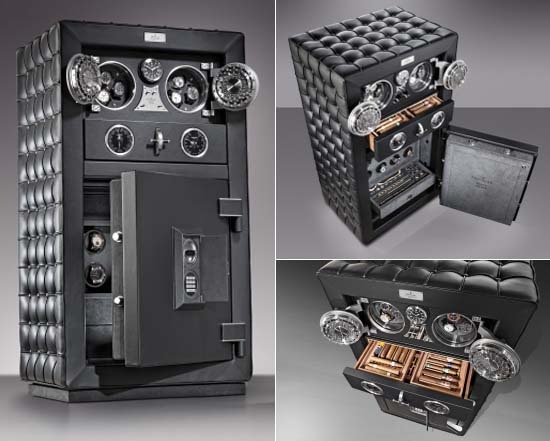 The bespoke German luxury safe manufacturer Doettling which recently delivered the world’s first travel safe Guardian for the likes of jet-setters, and earlier impressed us with its hand-crafted masterpieces like the Doettling Colosimo Double Wing which was inspired by the 1954 Mercedes-Benz 300 SL “Gullwing”, the safe for the $2.5 million Jaeger-LeCoultre watch set, the Colosimo, the iPad controlled Hublot Morphosis safe, the Colosimo leather and spikes edition, the Bel-Air collection that gets a custom made Magnus safe for a watch collector, and the world’s most expensive safe by Karl Lagerfeld, has now created the world’s safest luxury safe, the Fortress. Defined to be the master of all security classes, offering unrivaled insurance cover of up to $1,000,000, the Doettling Fortress which comes upholstered by hand with its signature quilted calfskin, impressively introduces us to the new era of security. This website is worth everyone to visit.